September 3, 2010 - Comair president John Bendoraitis announced the company’s plan to decrease the number of 50-seat aircraft from its fleet over the next two years in an effort to increase the stability of the company in this competitive industry. Teamsters Local 513 in Florence, Kentucky represents more than 750 workers at Comair. The union will monitor this process to ensure their members’ have a say in any staffing reductions that may occur as a result of the decrease in Comair’s fleet. Comair was established in March 1977 and started operations in April 1977. It was founded by Patrick J. Sowers, Robert T. Tranter, David Mueller and his father Raymond in Cincinnati and began scheduled services with two Piper Navajo aircraft. Under its parent Comair Holdings, it became a public company in July 1981 to support the growth and capital requirements to upgrade their fleet. It became a Delta Connection carrier in 1984. In July 1986 Delta Air Lines acquired 20% of Comair stock. Delta Air Lines acquired full ownership on October 22, 1999 at a cost of over 2 billion dollars. Comair is a wholly owned subsidiary of Delta Air Lines headquartered on the grounds of Cincinnati-Northern Kentucky International Airport in unincorporated Boone County, Kentucky, United States, west of Erlanger, and south of Cincinnati, Ohio. Comair is one of the world's largest regional airlines and, with over $1 billion in annual revenue, would be considered a major airline carrier except for the fact that its aircraft seat less than 100 people. Another particularity of Comair's for an airline of its size is that the entirety of its fleet consists of variants of a single type, the Bombardier Aerospace CRJ. Operating under the brand name Delta Connection, Comair operates passenger services to a large number of destinations in the USA, Canada, Mexico and the Bahamas. In late 2006, Comair opened an additional crew base and hub city at New York's JFK Airport. Comair had the lowest percentage of on time flights of all major U.S. carriers during late 2006. This was the result of starting operations at JFK, congested airport with poor staffing and a poor terminal and aircraft ramp layout that severely dropped Comair's ratings in the DOT listings. In 2008, Comair tied with American for the lowest on-time performance, with 70% of its flights arriving on-time. During the course of 2007, Comair closed down its crew bases in Greensboro, North Carolina and Orlando, Florida (for the 2nd time). 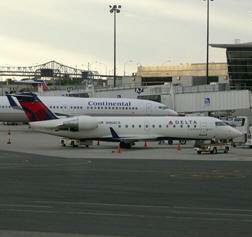 Parent company Delta Air Lines replaced Comair's service in these destinations with Atlantic Southeast Airlines, a subsidiary of SkyWest, Inc., and Chautauqua Airlines, a subsidiary of Republic Airways Holdings. In early 2008, Delta announced it was going to reduce its domestic capacity by 4-5%, in which Comair will reduce its 50-seat Canadair Regional Jet fleet by 8-14 aircraft. In March 2008, when oil reached over $110 per barrel Delta announced it would further reduce domestic capacity. Teamsters Local 513, along with leaders from the Air Line Pilots Association and the International Association of Machinists and Aerospace Workers, are scheduled to meet with Comair on Sept. 8 to discuss upcoming contract negotiations. Founded in 1903, the International Brotherhood of Teamsters represents more than 1.4 million hardworking men and women in the United States, Canada and Puerto Rico.